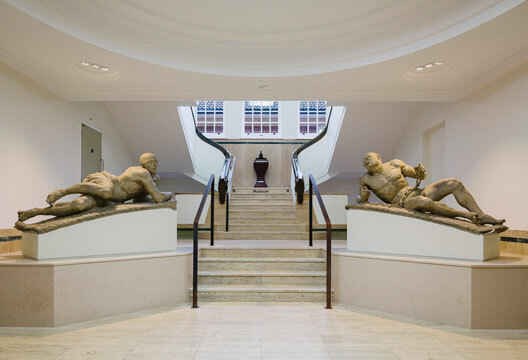 Dr Sally Marlow visits the Bethlem Museum of the Mind. Since its inception in 2003 the prestigious annual Art Fund Prize for Museum of the Year has been a showcase for an surprisingly wide range of museums across the UK. This year one of the nominations is Bethlem Museum of the Mind, a small but perfectly formed museum to mental health, which is part of the mental health trust I work alongside, South London and Maudsley. Since the Museum moved to its new building in February 2015 I have been meaning to take a look, but like most things that are in your own backyard, it sometimes takes an extra push (like a nomination) to make a trip. I should have visited earlier. There is much to provoke thought here, all housed in a building that used to be an administrative centre for the Bethlem Hospital, and sitting right in its centre. We entered to the famous life-size statues of ‘Raving and Melancholy Madness’ that greeted patients and visitors at the entrance of the Bethlem Hospital from 1676 to 1815. They are extraordinary in their power, portraying the two dominant conceptualisations of mental health at the time: mania and depression. Raving is chained, raising uncomfortable questions from the outset about restraint and freedom, stigma and stereotypes, and further on is displayed a straitjacket and, behind a wall and against a mirror so that only the reflections can be seen, a collection of leather restraints. One of the rooms contains padded walls salvaged from the hospital, and at all times you are aware that this is a place where mental health treatment of all types happened. There is also clever repurposing of the building itself, with the dark rooms housing the collections giving way to corner spaces overlooking the beautiful gardens of the Maudsley, where light swims in from windows at foot level, and from portholes in the roof. Highlights include works by Richard Dadd, who was at Bethlem himself, having been declared a ‘criminal lunatic’ after he committed a murder in the 1840s; and by Louis William Wain, known for his images of cats. I visited with a colleague, Dr Richard Corrigall, a consultant psychiatrist specialising in adolescence, and an artist himself. We looked together at William Kurelek’s famous ‘The Maze’, depicting the inside of his ‘unravelled head’, and partially painted while he was a patient at the Maudsley. I could not begin to describe on paper why Kurelek’s image is so powerful andenduring, but it is. As I stood in front of it, viewing it from the vantage point of ‘well’, it left me with an impression of my own head, and how close to unravelling any one of us might be at any time. As we looked at a piece by Joan Molly, in which a broken grandfather clock spewed forth billows of purple velvet from the open door of its tower, Dr Corrigall and I talked about the roles art can play in mental health. It can help those with mental health problems make sense of their illnesses and their identity; it can convey to others what it feels like to be unwell, communicating something that can’t be explained by science; and crucially it can break down the stigma surrounding mental health by its very humanness of self-expression. This museum, with its clever juxtapositions of art alongside mental health artefacts, achieves all of these and more. The Museum houses permanent and temporary collections, but that is not the whole story. Its central aim is to educate, to inform, and to promote understanding about the context of mental health and mental health care. To this end, items from the collections may be borrowed, and whole exhibitions can be loaned. There is also a small reference library, and comprehensive archives, dating back to around 1550, including patient records from the 1850s. All are available to researchers, and there is a dedicated archivist to facilitate access. Vicky Northwood, the Director of the Museum, is on a mission to expand its educational function. To facilitate this, on Mondays and Tuesdays the Museum is closed to the general public to allow group visits: groups of students in search of knowledge to enhance their studies; or clinicians and service users interested in the insights the Museum can provide. Other than students, clinicians and service users, who comes to the Museum? The general public are coming in their droves, and it’s everyone from local people to an international audience. Visitor numbers are steadily increasing, and the buzz created by the Museum of the Year nomination can only be a good thing. Whatever the young man had not been given, he might just have found it in this museum. - The winner of the Art Fund Prize for Museum of the Year is due to be announced on 6 July at a special dinner at the Natural History Museum in London.